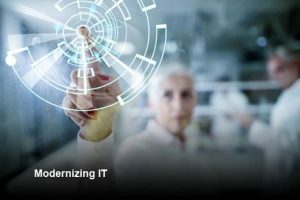 If your business applications exist in an IBM mainframe environment, you may be dealing with higher costs of maintenance, a diminishing workforce of mainframe specialists, and a shrinking pool of vendors from which to choose. Additionally, your business agility and competitive edge may need the boost that only today’s mainstream technology can support. The need to cut costs while keeping up with change is a challenge for all companies, but these challenges are more acute with companies on legacy mainframes. They’re losing their ability to pursue opportunities because their IT departments must focus on maintenance instead of innovation. Their applications may also be at risk, because they must make the uncomfortable decision between a large-scale upgrade and keeping their applications in a costly environment. The word modernization is used to describe ongoing innovation that’s worked into an application in periodic projects or more gradually over time. Sometimes applications run for a long time with only business or defect maintenance applied, then suddenly they need to be modernized as they lack important features relating to their user interface or the way that data management is handled. Many companies have embraced the idea that applications should be both maintained and modernized as part of normal day-to-day operations. These companies have money and people allocated to a given application set. They distribute resources between fixing the application and making other necessary changes, leaving time and assets for keeping up with strategic needs. This has become a common practice for companies that are balanced in their approach and are trying to avoid plunging into a large-scale technology migration. G&G Technologies supports you through the digital transformation of your organization, your processes and your infrastructures to boost your agility, service quality and control over your running costs.